Tamara Mena producer, co-writer and actor in "Rivals or Friends" short film. 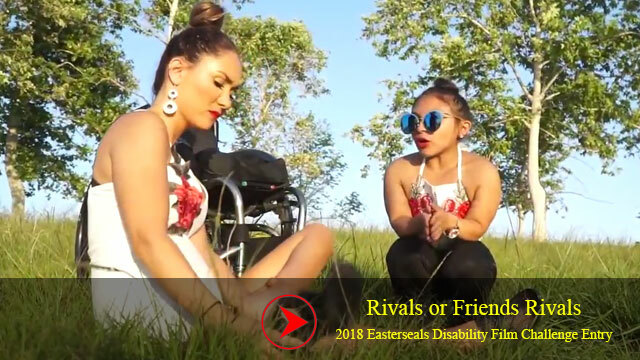 “Easterseals Disability Film Challenge” nominated Tamara as “BEST ACTOR”. Click here to see video. Check out her interview and news story by KTLA 5 News at the awards ceremony! Click here to read story. Cheers to turning 33 years old today!! After facing near to death experiences, every birthday is a reminder that I made it another year, thanks.. Bringing Coachella vibes to the beach because it’s my birthday weekend (SUNDAY!) YAY! The celebration begins! Who cares if you are different…?.. I’m So blessed to have women like HER Chiquis support THIS SPECIAL PROJECT, YAY!! !❤️ #godissogood #honored *️⃣Special THANK YOU TO..
Muchas Gracias a la bella Rosie Rivera por el gran apoyo con mi cortometraje Dear Younger Me y por compartir este proyecto tan especial!!!❤️.. Please please keep watching our short film #DearYoungerMe AND sharing this!! !❤️ Hope you can all help us win this challenge!!! *️⃣But..